﻿ HBA detailed explanation, how much you know? Host bus adapters (HBAs) are a circuit board and/or IC adapter that provides input/output (I/O) processing and physical connectivity between servers and storage devices. Because HBAs reduce the burden on the host processor in data storage and retrieval tasks, it can improve server performance. An HBA and a disk subsystem that is connected to it are sometimes called a disk channel. The general definition of HBAs – I/O adapters that connect the host I/O bus and the computer memory system. According to this definition, like the video card is connected to the computer and memory, the NIC is connected to the network bus and memory, the SCSI-FC card is connected to the SCSI or FC bus and memory, they should be considered HBAs. HBA cards include FC-HBA and iSCSI HBAs and other HBA cards in the future, but HBAs are typically used in SCSI. Adapter (adapters) and NICs are used for FC, and NICs are also used for Ethernet and Token Ring networks. We know that a computer is mostly connected by two buses (of course, the actual situation will be different, here only to discuss the common, simple situation), a bus called the system bus, another call I/O bus. System bus on the CPU, memory, cache and so on, I/O bus is the peripheral equipment, and now the most common is the PCI bus. The two buses are connected by a bridging chip or circuit. To give an example, like a city, there are two main roads, one belongs to the administrative district, one belongs to the commercial area, the middle has a roundabout, the two main roads are connected together, the system bus is like the main road in the district, and I/O bus is like the main road in the commercial area. System bus and I/O bus bandwidth units are Gbyte to remember, but it is obvious that the main trunk road and commercial area of the district compared to the backbone, the former is certainly more “core”, wider, smoother, design requirements are high. Although the I / O bus speed is much lower than the system bus bandwidth, whatever the outcome is Gbyte to measure, and we know the speed of peripheral devices, often only a few hundred trillion, or even dozens of k only, how to coordinate the work? It is easy, we are going to organize the peripherals, connected to the I / O bus up! HBA refers to the Host and I / O BUS directly an adapter, but also like a plumber often say “double pass.” The role of HBA is to achieve the internal channel protocol PCI or Sbus and Fiber Channel protocol conversion between. In the early SAN storage system, the server and the switch data transmission is through the fiber, because the server is the SCSI instruction to the storage device, can not take the ordinary LAN network IP protocol, so the need to use FC transmission, so this SAN is called FC-SAN, and later appeared in the IP protocol package SAN, can take the ordinary LAN network, so called IP-SAN, the most typical of which is now the popular ISCSI. These two methods need to carry out a heavy data packet unpacking package operation, so a high-performance SAN system requires a network card that is dedicated to unpacking the server to reduce the burden on the processor. This NIC is called the HBA card, which in addition to the work of the unpack, of course, can also provide a fiber interface (if the iSCSI HBA card is to provide a common RJ45 interface) for the corresponding switch connection; HBA physically you can plug it into a PCI or PCI slot as a network card, so the use of this device is much like a network card, and many people confuse it with a common NIC or a common fiber-optic card. Of course, some iSCSI HBA cards can be used as a normal network card, but it is very uneconomical to consider the price. The common data communication protocol between servers and storage devices is the IDE, SCSI, and Fibre Channel. To achieve communication between the server and the storage device, the same communication protocol is required at both ends of the communication. A controller is typically available on a storage device, and the controller implements one or more communication protocols that enable the conversion between storage protocols such as IDE, SCSI, or Fibre Channel to the operating protocols of physical storage devices. The communication protocol of the server is implemented by an integrated circuit of the expansion card or motherboard, which is responsible for the conversion of the server bus protocol and the IDE and SCSI storage protocols. For example, in a PC, the features of the IDE protocol are on the motherboard, and the IDE’s disk controller features an IDE protocol. Therefore, the IDE disk can be connected to the IDE connector on the PC. If the disk only supports SCSI protocols, the disks cannot be directly connected to the PC. You need to insert a SCSI card on the PC expansion slot and the SCSI disk can be connected to the card. SCSI card enables PC bus to SCSI conversion. This kind of SCSI card realizes the function is the host Bus adapter card function. If the disk supports only Fibre Channel protocols, then the Fibre Channel protocol is required on the server because the high-speed characteristics of the Fibre Channel are not supported by the general Server Board and require a dedicated host bus adapter card. Once the server is plugged into the host bus adapter card, it can be connected to a Fibre Channel-enabled disk. Host bus adapter card inside has a small CPU, some memory as a data cache and connect the fiber channel and bus connection devices. This small central processor is responsible for the conversion of PCI and Fiber Channel protocols. It also has some other functions to initialize the server port connected to the Fiber Channel network, support upper layer protocols such as TCP / IP, SCSI, 8B / 10B encoding and decoding. Because of the different transmission protocol, the network card can be divided into three kinds, one is Ethernet card, the other is Fiber Channel network card, and three is the iSCSI network card. 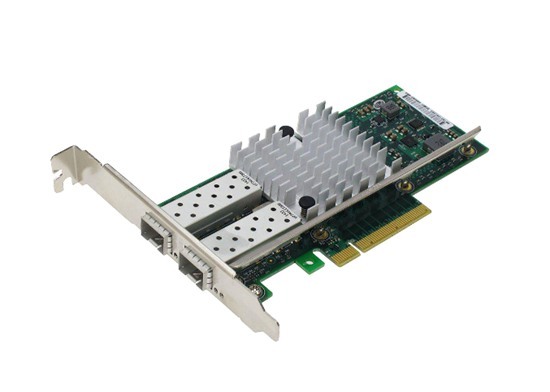 Ethernet Network Card – The name of the Ethernet Adapter, the transmission protocol is an IP protocol, typically connected to an Ethernet switch through a fiber optic cable or twisted pair. The interface types are divided into optical and electrical ports. Optical ports are generally transmitted through fiber optic cables, the interface module is generally SFP (transmission rate GB) and GBIC (1GB/s), the corresponding interface is SC, ST and LC. The current commonly used interface type is RJ45, it is used to connect with twisted pair, also has an interface with coaxial cable, but now it is used less. FC Network card – generally also called fiber optic network card, scientific name Fibre Channel HBA. The transport protocol is a Fiber Channel protocol and is typically connected to a Fiber Channel switch through a fiber optic cable. The interface type is divided into optical port and electrical port. The optical interface is generally through the fiber optic cable for data transmission, the interface module is generally SFP (transmission rate 2Gb / s) and GBIC (1Gb / s), the corresponding interface for the SC and LC. The interface type of the electrical interface is generally DB9 pin or HSSDC. iSCSI Network card – The name of the iSCSI HBA, the Transport iSCSI protocol, and the interface type is the same as the Ethernet card. We say “fiber-optic network card” generally refers to the FC HBA card, plug in the server, external storage with the fiber switch; and optical Ethernet card is generally called “fiber Ethernet card” is also inserted in the server, but it external Is the Ethernet switch with the optical port.